India's film awards are coming to Canada in June, following a well-worn path for the films they celebrate. About 100 Indian films are screened in commercial cinemas in Canada each year. On television, one company, Asian Television Network, owns "several Bollywood movie channels with 800 movies a month." Some of those films will almost certainly be winners when the International Indian Film Academy (IIFA) awards take place in Toronto from June 23 to 25. It will be the first time the ceremonies have been held in North America. The first Indian cinema in North America opened in Toronto in 1969. More such cinemas followed over the following two decades, usually owned by Indian entrepreneurs. With the rise of the home video and DVD markets, numbers declined, with only about four still operating in Canada. Over the last decade Indian films have moved to the mainstream cinemas. Kyle Moffatt of Cineplex Entertainment, the largest movie exhibitor in Canada, told CBC News the company treats the Indian films it screens "the same way as Hollywood blockbusters." 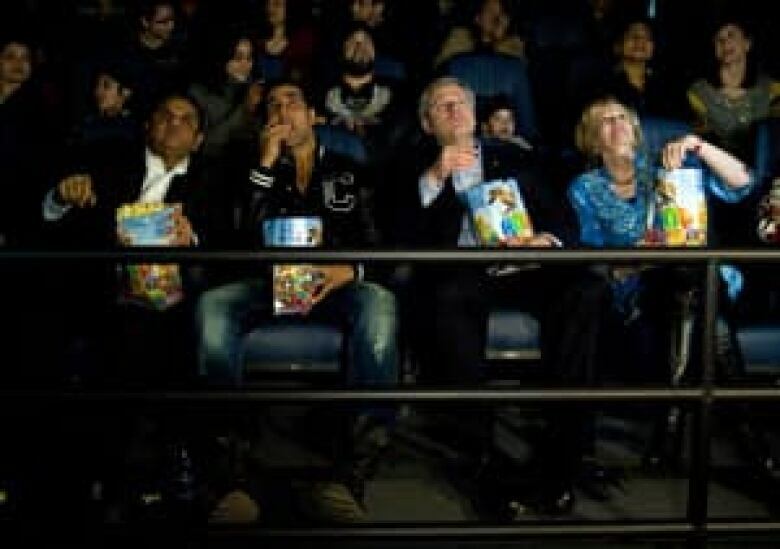 Prime Minister Stephen Harper, second from right, and his wife, Laureen, are joined by Bollywood star Akshay Kumar, second from left, and film producer Ajay Virmani to see the Canadian premiere of Kumar's film Thank You at an election campaign event at Cineplex's SilverCity Cinema in Brampton, Ont., on April 8. (Sean Kilpatrick/Canadian Press)) Both Cineplex and Empire Theatres, the second largest exhibitor in Canada, screen South Asian films at their cinemas, usually multiplexes, located near South Asian communities. The blockbusters usually get released in Canada around the same time as in India. Two of the top five North American screens for Indian films are in Canada, according to Cineplex's Moffatt. Indian blockbusters are usually sellouts when they begin their runs in Canada, he says. "The community absolutely loves" being able to see the same films when they hear about them from their relatives back home, Moffatt said. Ken Naz, the North American president of film distribution company Eros International, estimates that about 100 South Asian films receive a theatrical release in Canada in an average year, and about 40 of those would be Bollywood films. For the Indian film industry, Naz said, a production is designated Bollywood if it's "a commercial movie geared to a commercial cinema." The IIFA awards, which come to Canada this month, include much more than the ceremonies themselves. Last year, for example, Indian models showcased designs from Manish Malhothra during a fashion show as part of the three-day long IIFA awards in Colombo. (Eranga Jayawardena/Associated Press) The most important Canadian broadcaster of films from India is the Asian Television Network. The company, which started in 1990 in Newmarket, Ont., now has 33 specialty channels and broadcasts in a number of Asian languages. It claims to carry 800 movies a month over the 33 channels, which include 15 channels that are feeds of channels in Asia. The last couple years have been good ones for ATN shareholders. The stock price is five times higher than it was in February 2009. After the ATN channels, the next best source for Indian movies on Canadian television are the movies-on-demand services from Rogers and Bell. For Eros, the largest international distributor of Indian films, the DVD and video markets do not provide a significant revenue stream. Ken Naz told CBC News that pirated versions pose a big problem for the industry. Legitimate copies of DVDs can be purchased at Wal-Mart and many Indian stores in Canada. Naz also said that Netflix has become big for Eros in the U.S. and expects the same for Canada as Netflix expands here. Naz used to live in Toronto but now heads Eros's North American operations from New Jersey. He estimates that Eros handles 40 to 70 per cent of Indian film distribution both worldwide and in Canada. He likes to point out that ticket sales worldwide for films produced in India exceed the number for Hollywood films. He also notes that while about 1,000 films are produced in India every year, only about a third have a chance of getting a theatrical release. Bollywood actors, from left, Sharman Joshi, Aamir Khan and R. Madhavan attend a promotional event for their comedy 3 Idiots in Mumbai in November 2009. (Manav Manglani/Reuters) Canada and other markets outside India are important to the Indian film industry. For example, 3 Idiots, the highest-grossing Indian film of all time, has earned about one-fifth of its total box office outside India since its release in 2009. It has earned more than $6.5 million in North America, accounting for almost half of 3 Idiots' overseas box office receipts, according to boxofficeindia.com. While not much by Hollywood standards, the movie was shown only on a handful of screens, which makes its box office impressive in Naz's view. The film, a comedy in Hindi, is about three engineering students who become friends when they share a dorm room.